A massive congratulations to Hannah Leahy, our ladies footballer, who made her senior competitive debut for Dublin on Sunday. She came on as a substitute in the second half in Dublin’s comprehensive victory over Tipperary. It is brilliant to see Hannah getting her chance to prove herself with the Dubs, and we hope it continues! Keep it up Hannah! All members are reminded that National Club Draw tickets are due back by the very latest THIS THURSDAY EVENING in the clubhouse. Tickets can be returned to TJ Farrelly. Tickets need to be returned whether they are sold or unsold. TJ can be contacted at 0868326644. 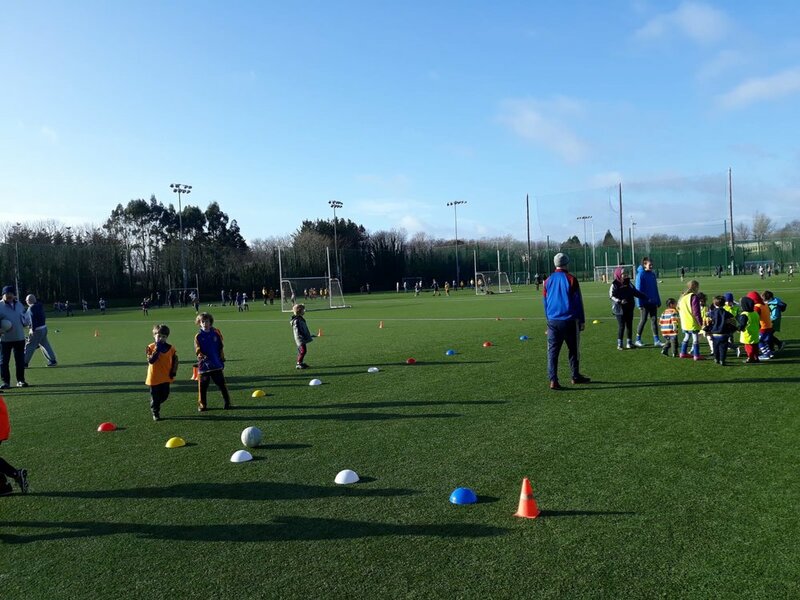 The Level 1 Coaching Course has concluded in Scoil. 21 of our volunteers attended over the past four Friday nights and a full Saturday. Thanks to Thomas, Tommy and Johnny for excellent tutoring. The course was very successful, and there will be an aim to have this course run again soon. 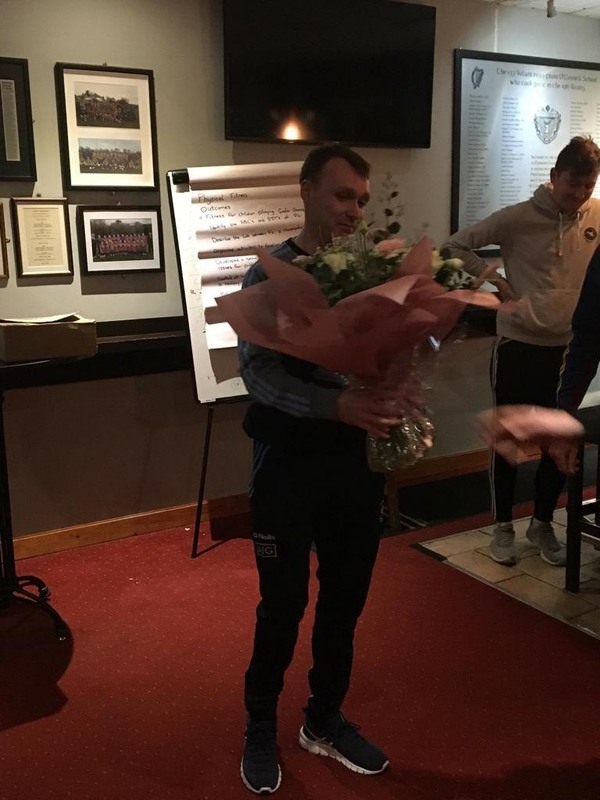 Feedback from volunteers was great and Thomas even received a bouquet of flowers to congratulate him on his engagement to Emma, congratulations to both of you. Nursery: It was a cold and breezy morning however we still had a great turnout. The blues worked hard on their football and hurling match skills. The green and yellows worked hard on their football skills. The coaches were really impressed with the effort the kids made. U7’s: We had a great turnout for our third and fourth week at Gormanston indoor hurling event. Both teams played really well and kept their positions and made some super passes and strikes leading to a number of great goals! !Next week is our last week. Well done to all the kids and more importantly the parents for getting them out so early. 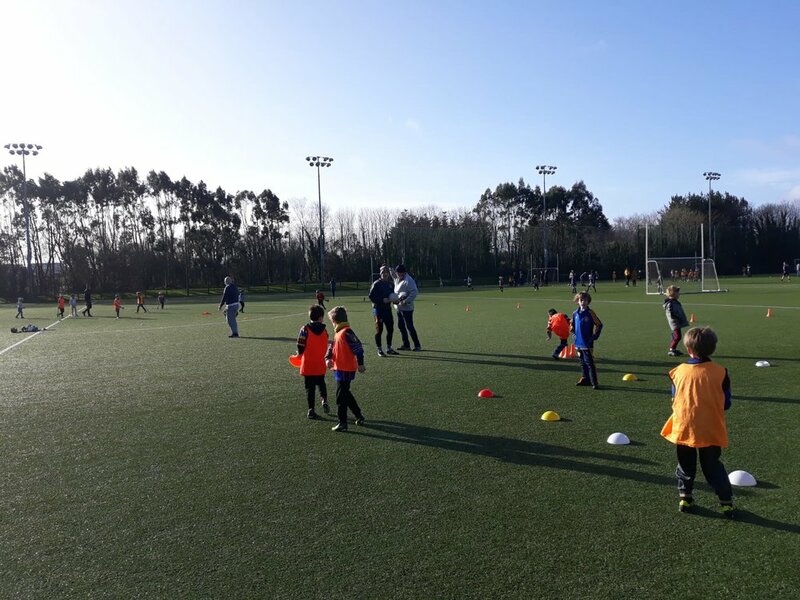 U8’s: The under 8s had a busy week with a pre-season friendly match on Saturday against Fenians from Swords as well as heading to Gormanston on Sunday morning for week 4 of the tournament where our unbeaten record was broken by a gritty encounter with the Meath team Kiltale. In Swords, Sarah and Malik were both spotted by the opposition's coaches for special mention. Tyler was also on form on his birthday. Eoghan and Liam worked hard to keep their team in touch with the Swords boys. In Gormanston Ryan made some great saves. Sophia continued to play well. Rory played great in defense and forward. With great attendance the coaches were able to select from a large panel of players and players were given chances in various positions. With the weekend of football and hurling, the team showed that like Denis Bastick this team are going to go far and even in tougher encounters they never give up and keep going and the scores come. Looking forward to our first league match this week. Adult Footballers: Adult footballers begin their league campaign this weekend, so best of luck to all footballers who will be out playing this weekend. It is vital to get off to a winning start in the league and preparations have been in place since early January building toward this weekend. Remember those early Saturday mornings and freezing recovery sessions in the Baths in preparation for your match! Club Brand Guidelines - A reminder to all club members that there are a set of club brand guidelines that are to be adhered to when using the club colours for any and all usages. All gear/merchandise should be cleared by Joey Ryan or Alva Cushen before being ordered. 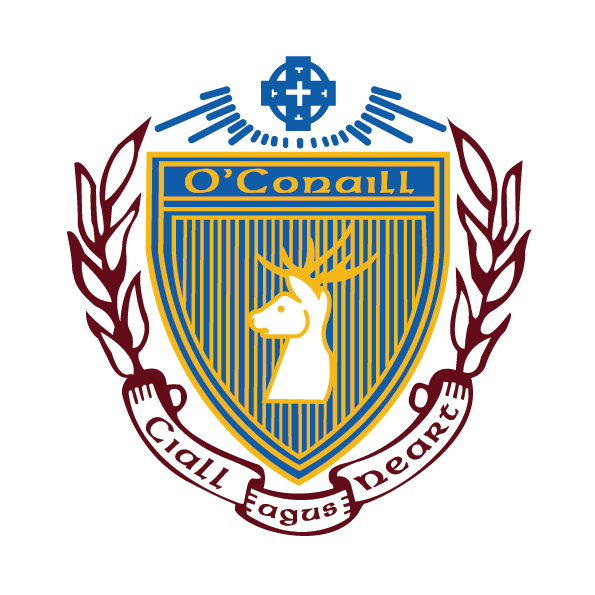 The email for contact is scoil.pro.eoc@gmail.com should you have any queries regarding this. Mentors Night - The annual mentors night takes place this Saturday 16th February in the club at 8.00 p.m. Any member in the club who is involved in a mentoring capacity is invited, it is set to be a super evening! Car Park - A message for all who use the car park during the week for training, whether collecting or staying for a prolonged period. Please be careful when driving in or out of the car park. There have been a number of instances brought to my attention over the past couple of weeks where cars have sped up/down the slipway leading into the car park. This is extremely dangerous as the walkway from the dressing rooms and clubhouse lead directly onto the pitch underneath the floodlights, where most training sessions have been taking place. Your cooperation is hugely appreciated. Thank you. Seachtain na Gaeilge - Seachtain na Gaeilge will be taking place from the 1st to the 17th of March this year. To celebrate, the club is organising a ‘Seisiún Ceoil’ in the clubhouse on the 16th of March. More information will be posted nearer the time, but keep the date free! Senior Football (Div 2) - Home to Clontarf in Scoil @ 10.30 a.m. Sun 17th Feb. Junior Football (Div 7) - Away to Innisfails in Innisfails @12.00 p.m. Sun 17th Feb. Junior Football (Div 11 North) - Away to St. Vincents in Pairc Uinsionn @ 3 p.m. Sun 17th Feb.
Juvenile Boys - U8 home v Finians 10am. U9 away v Lusk 10am. U10 home (Alfie) v Finians 10am.U11 home (Alfie) v Stars of Erin. U12 away Kilmacud 12.15. U13 home (st Anne’s 22) 1.30pm. U14 home (st Anne’s 22) 3pm. U15 home (st Anne’s 22) 11.30 Sunday. Please get out to support your club wherever possible! Up Scoil!